The Bold Type is an American 60 minute scripted romance television series, which kicked off on June 20, 2017, on FreeForm and is broadcast every Tuesday at 20:00. The show is currently in its 3th season. 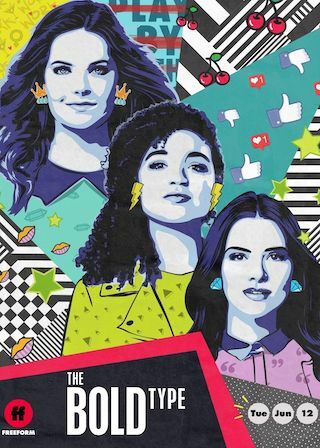 FreeForm has officially confirmed the renewal of The Bold Type for Season 4. The exact release date is yet to be announced so far. Sign up to track it down. reeform's "The Bold Type" will end its second season with a first-class trip to Paris for Kat, Sutton and Jane. The breakout drama, which has seen an impressive growth in ratings year-over-year, will air its season finale TUESDAY, AUGUST 7, at 8:00 p.m. EDT/PDT. The critically acclaimed drama will return to Freeform for a third season in spring 2019. In the season finale, "We'll Always Have Paris," Sutton's professional dreams come true when she jets off to Paris for Fashion Week, but while there she gains a new perspective on her situation. Jane moves forward with her fertility plan, until she learns surprising news about her options and is faced with Ben and Pinstripe's different solutions. Kat faces pressure from Jacqueline to make their Paris party a success while attempting to reset her relationship with Adena.